Tree and animal species are symbols of Gods and Goddesses in Indian culture making ritual beliefs an important consideration as we seek to protect our rich biodiversity. 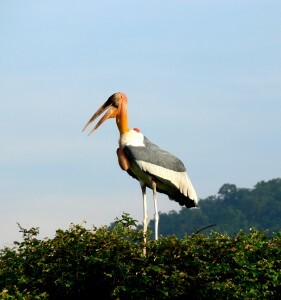 Indeed, I have found ritual beliefs to be a major tool for conservation awareness during my entire journey with the greater adjutant stork in a small Assamese village called Dadara. The greater adjutant stork (Hargila in Assamese) is a threatened bird and Assam is considered its last global strong hold. Hargila make their nesting colonies mainly in tall, privately owned trees. With about 500 birds in three villages, the area hosts the largest nesting colony of this species in the world. The global population of this bird is about 1,000 individuals. The key to the survival of this species is achieving the good wishes of the villagers towards this bird. This is our work. On September 5, 2015 I was amazed to witness the villagers of Dadara incorporate Hargila into one of their most sacred religious festivals, Jonmastami (the birth of Lord Sri Krishna). This is a remarkable transformation. When we started this work in 2008, villagers complained about the bird and cut their nesting trees. Hargila population numbers therefore suffered. Through years of active community engagement, the villages have taken ownership of the species, and they are proud to live with Hargila. Population numbers of Hargila are now growing. Tree owners used to cut nesting trees to get rid of the birds. The only solution I could think of at that moment was to give direct cash in exchange for not cutting trees on private land. If I did this, the whole effort could have failed; we didn’t have any sustainable support for cash rewards. So, we had to think again. After a few visits we thought of a solution and a few words clicked: “awareness, education,ownership.” I had asked myself why I didn’t dislike my daughters when they made a mess as young children. Because they are my children…I have “ownership” of them. This was the solution, without any doubt! To help people take ownership of the storks, we conducted conservation awareness campaigns in the villages with different target groups: men, women, school children, local police, and the local forest department. We organized cooking, crafts, and folk music competitions for the women who did not want to come out of their houses for discussions. We played a“web of life” game with them to make them understand the importance of each species in their surroundings. We also organized continuous pride campaigns with youth and school children to make them aware that they should be proud to live with this bird. We selected a local school in Dadara where the majority of tree owner’s children get their education. By involving the school teachers in our work we were able to offer continual environmental education to the children. He laughed and I saw the charm in his eyes. Slowly, people started joining us. A group of youths joined us voluntarily to monitor the nests and rescue storks that had fallen from their nests. 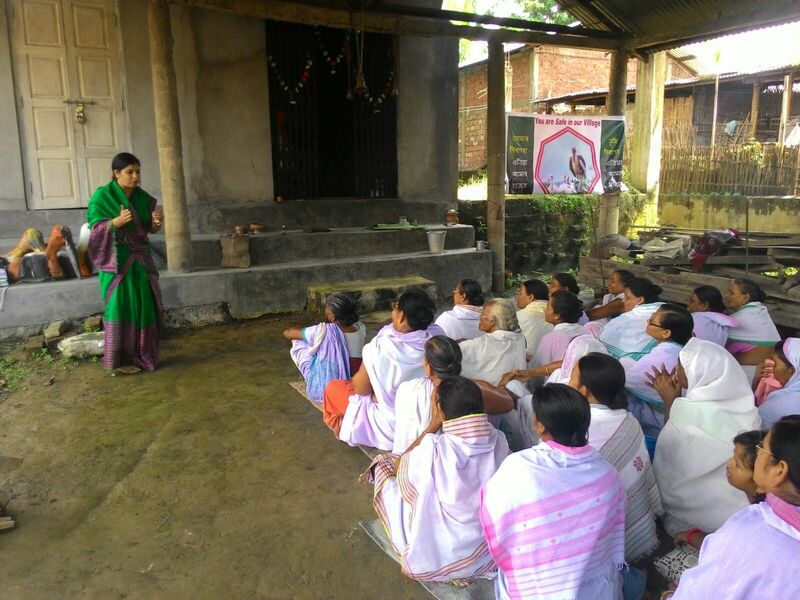 A group of women also came forward to join us to celebrate the breeding season of the bird exactly as they celebrate pregnancy of women of the village. Most people imagine that the police are insensitive to wildlife conservation, but we know differently. The police are resource-rich in emergency situations and if they want to, they can be game changers for the conservation of greater adjutants. The Kamrup District Superintendent of Police, Partha Sarathi Mahanta, in particular, helped us in every possible way and made our mission his own. He alone released four rescued chicks that had been hand reared by a facility run by the Wildlife Trust of India. The released chicks were named Monalisa, Lulu, Saru and Rima (after the tree owner’s daughters and wife) and this simple gesture generated even more warmth and support for the birds. I still remember one bird whom we named Christina, which attracted media. Dadara proved that community driven conservation is the key to protect wildlife. There were 15 nesting trees of greater adjutants in the village in 2008 when I started my work. Last year we counted 171 nests. Kudos to the tree owners that from 2010, there was not a single tree cut down in the villages. Encompassing the campaign into the village’s ritual belief system has also played a large part in the effort to protect the species. 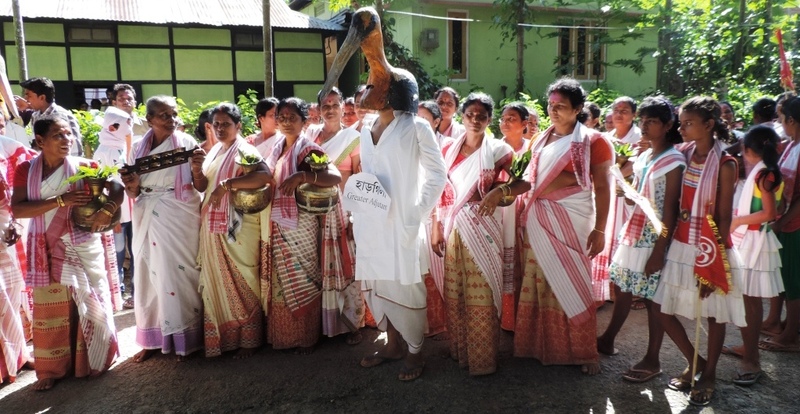 The villagers have included the stork campaign in their holy book Geeta Bhagawat procession, which has increased awareness of the bird. It’s hard to believe that a few years back, village women ignored this bird. Now they pray to God for its safe future. This was the result of the long works of the conservation team of Aaranyak, volunteers from a local school in Dadara and conservation workers in the area. This would not have been possible without the continuous support of the Conservation Leadership Programme. My friend Mridul, Simanta and Konseng were with me on 5 September at Dadara. When the village women group was offering prayers to God for the welfare of greater adjutant and for a successful breeding season ahead, they were stunned and speechless. 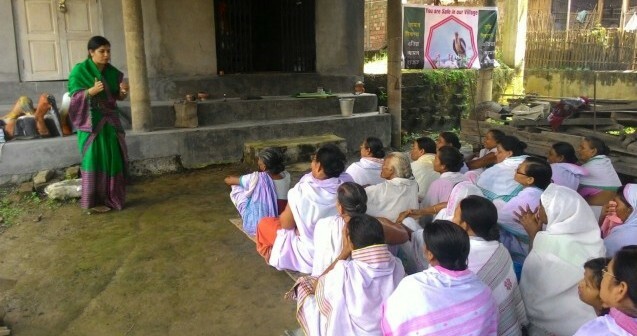 Mridul said, “It’s time to go home Purnima ba (sister), let us make a report of this programme and let the whole world know about the efforts of the villagers of Dadara for saving this endangered bird.” This shook me and I realized that yes, this community is amazing and needs loud applause from every corner of the world. There are many miles to go, and we are walking together.